The first fat storing and age accelerating hormone I am putting here is also the most destructive one. If growth hormone is Superman, cortisol is Lex Luthor. It does the exact opposite of growth hormone. Cortisol is one of the adrenal hormones. It is secreted during times of stress. That is, any kind of stress: mental, emotional or physical. Cortisol helps us deal with our “fight or flight” response. As such, it is called the “stress hormone.” It is the main hormone which prepares our body for dealing with stress just like adrenaline does. However, over time, when this hormone is released consistently, it causes fat to be stored. Specifically in and on your belly. There are other negative things this hormone does to not only sabotage your weight loss, but also cause serious health risks. High cortisol and belly fat are almost always going to be found together. In the short term, burns fat … in the short-term. Just like adrenaline. But unlike adrenaline, it remains in blood for a longer time. This is an important point to know when losing weight. When you do not allow yourself, or cannot lessen the stress and let your body and adrenals recover, cortisol stays in the blood for an exponentially longer period of time. 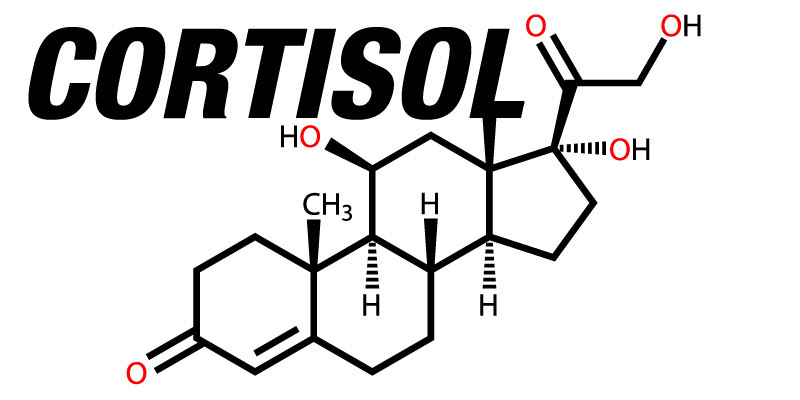 Cortisol breaks muscle down and uses it for protein which is broken down into sugar for energy. So your metabolism starts to use your muscle for fuel, specifically your thigh muscles. You will also see the arm muscles looking atrophied. fat is created and stored in the midsection. This hormone moves fat from storage depots and relocates it to fat cell deposits deep in the abdomen. So you get belly fat. You will see a pendulous and sagging abdomen. Cortisol causes the lining of your stomach to get very thin. This prevents your stomach from producing enough hydrochloric acid. Hydrochloric acid is the most important substance your stomach produces. When there is too little hydrochloric acid produced, food does not digest or breakdown. This causes bloating right after eating and eventually causes an overproduction of other acids. This is the sour and acidic feeling we take things like Pepto Bismol, Alka Seltzer for. A buffalo hump or a fat pad on the back and below the neck also forms. The accumulation of fat in the upper back, commonly referred to as “buffalo hump,” is typical in people with too much cortisol. Things like getting up and down from a chair or walking up stairs is hard now. The glutes and thighs are the densest muscles in the body. Thus they become the first target for a source of protein and glucose. You will notice some people have large midsections or torsos but thin legs and arms. There is fat accumulation on the face. There is extra facial hair for both men and women. The eyes and face get puffy as well and a double chin develops. Excited adrenals and their respective hormones will release blood sugar to provide quick energy for physical activity. – which is another fat-storing hormone (as you will learn about). Excessive adrenal hormones will also cause a depletion of potassium, which then causes the inability to absorb calcium into the muscles and bones. Over the short-term, this lack of calcium in the muscles causes cramps and inability to relax muscles. Over the long term, lack of calcium absorption will result in osteoporosis. your muscles just do not recover after exercise as well. Then there is tightening of blood vessels. Part of the function of adrenal hormones is the contraction and relaxation of blood vessels. When there is not enough adrenaline, a very important blood vessel called the coronary artery can get too tight and not relax which leads to the tightening of the chest and chest pains. Due to the decrease in potassium, there is an imbalanced amount of sodium. This imbalance of excess sodium will cause water retention. Since there is too little potassium, hypertension starts to develop (one of the symptoms of potassium deficiency). The blood cells also get engorged. Even to the point where they cannot fit into the small capillaries. To reduce the excess water retention mentioned just now, your body will try to rid itself of this excess water by making you urinate more. The excess salt starts to be eliminated this way. The reduction of sodium will cause less water to be held in the body. The person also starts to simply feel dehydrated but drinking water actually makes them feel MORE dehydrated. The increase in thirst will cause you to drink more water. But because there is a mineral deficiency, water does not hydrate you and you feel washed out. It actually takes more minerals out of your body. The imbalance of the fluids in the body now causes a craving for salt and sharp cheese. Cheese balls are about as addictive as crack-cocaine. As a further result of the potassium-sodium imbalance, part of the chain reaction involves the inability to absorb calcium. The calcium, since it is not absorbed and used by the muscles and bones is urinated out and/or deposited on the organs. You will also find in these cases, bursitis, heel spurs, arthritis, tendonitis, arteriosclerosis, calcium deposits in the kidneys, and twitching of the muscles. The lack of muscle relaxation will also make it hard for a person to relax and sleep. The sleep/awake rhythms get skewed. It is difficult to get to sleep and have deep sleep. You will have tiredness during the day and wakefulness during the night. This is simply because adrenal hormones are produced to help you counter something stressful and prepare your body for action. This, combined with tense muscles makes it a recipe for insomnia. Cortisol can weaken the activity of the immune system. This is why illness is preceded by a stressful event. This used to be based on intuition but is now has a scientific basis. In studies, it was found loss of collagen from skin, caused by cortisol, is ten times greater than losses from any other tissue. So when you notice a “stressed-out” person looking like they aged 10 years, this is the reason. Again, you can use the example of a President before and after his term and see how much he has aged in those years. In the past, when the Growth Hormone was discovered as an important hormone to help people, the old solution was to increase it through injections. But now it is discovered cortisol, in excess, and in constant stimulation undoes all growth hormone does. So the problem is not always insufficient GH, it is too much Cortisol. Studies have also shown excessive and constantly high levels of cortisol reduce memory. These are things I saw happening with people who had excess cortisol. There is sometimes a constant fatigue and a manifestation of a person dragging around. They look washed out and drained. This is constant now. They also have brain fog. It is hard to think and remember simple things during the afternoon. The person is out of breath while climbing stairs when there is no reason they should be. They work out and are not physically debilitated yet they experience being out of breath doing simple physical activities. In the afternoon they feel sleepy. Then there is excessive worry and impatience. There is constant fidgeting and twitching. This is very exhausting to the individual (and to the people around them). This exhaustion leads to the need for stimulants. There is increased sensitivity to foods and food combinations. Excess cortisol makes your thigh muscles weak making it harder to climb stairs or get up from a chair. Other than that it is a joy! I cover this in depth in every step of the Metabolism Makeover. Every single step is designed to get you to become more aware of your sources of stress, both the hidden and visible ones. For this chapter, you need to leave with one concept… stress makes you fat and also kills you. Recuperation NEEDS to be one of the MAIN facets of a weight loss plan.